We love Raleigh weddings, but like to expand our services all over the US! That’s why we were so delighted when Danielle and Mitchell asked us to plan their vow renewals. 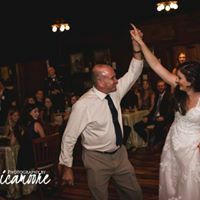 We found several different venue options within their budget in several states so they would have plenty of choices since Danielle’s family is from Michigan and Mitchell’s family is from eastern North Carolina. We were elated when they chose Buffalo Trace Distillery in Frankfort, Kentucky! 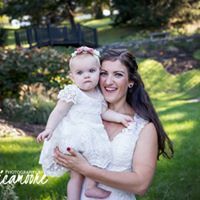 The couple was previously married in 2016, have a small ceremony with immediate family but longed for a larger celebration with extended family and friends. What a great surprise to find a date that worked for both families and a bonus was being together to celebrate their daughter Harper’s first birthday. So after a quick rehearsal, the celebration took place at a nearby park. 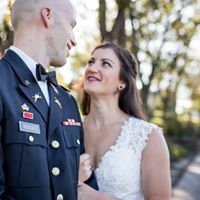 I Do’s: As guests made their way to the ceremony, they signed the guestbook a bourbon barrel head notated with the couple's names and date of their wedding. 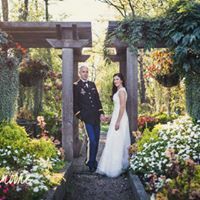 The aisle walkway was decoratively lined with baby’s breath filled mason jars, which Forward Fig put together, along with the bridal bouquets and centerpieces. Of course, their newly celebrated 1 year old, had to be a part of the ceremony! Both the Mother of the Groom and Mother of the Bride walked Harper down the aisle on a beautiful Kentucky afternoon. Their love shone through on this sunny afternoon with their daughter by their side and Danielle’s sister officiating. Tears, laughter and joy fell over the group as another kiss sealed the marriage. 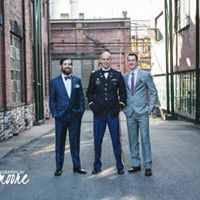 Post I Do’s: After the ceremony, guests were escorted on a tour of The Buffalo Trace Distillery! With over 200 years of hand crafted bourbon, this history had to be shared and tasted! Each guest got to taste bourbons and then purchase their favorite bourbon from Buffalo Trace. Once the tour commenced, the guests filled inside the club house which was a rustic log cabin and mason jars filled with: white hydrangeas, baby’s breath, stock, and lilies. These centerpieces were place on top of textured gold linens and accompanied by, white pumpkins and gourds. As for the food, 3 Peas in a Pod did a fantastic job satisfying everyone with stations set throughout the venue! Following dinner, the dessert bar was to die for. It included macaroons, mini pecan pies, bourbon ball truffle shooters, bread pudding with bourbon sauce, berry tartlets, and mini pumpkin pies. The dessert bar was a feast of its own! The bar of course, was stocked with beer, wine, and of course, bourbon! Throughout the night of food, drinks, and dancing, guests enjoyed an evening on the large wrap around porch with huge log wood rockers. At the end of the night, Danielle and Mitchell made their exit from that same wrap around porch, through a sea of bubbles and smiling faces! 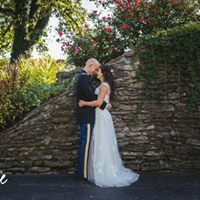 This couple was such a joy to work with and reminds us that we love celebrating with our clients as many times as they want, wherever they want! We wish Danielle, Mitchell, and Harper the happiest of lives together and many more celebrations to come!